This article is a short summary of Kirby's Dream Collection: Special Edition. Kirby's Dream Collection: Special Edition is a compilation release of previous Kirby games, released to celebrate the franchise's twentieth anniversary. In addition to the games, the collection also includes a booklet containing development information and concept artwork on several of the past Kirby games, as well as a soundtrack CD featuring 45 songs from across the series. The game was released in North America and Japan in summer 2012, and despite a European release of winter 2012 being announced in Official Nintendo Magazine, the game was never released in those regions. Complete with 6 classic games, soundtrack CD and anniversary booklet! Jump into an interactive celebration of Kirby’s 20th anniversary with Kirby’s Dream Collection Special Edition! 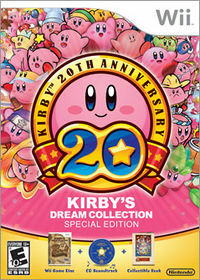 The package includes 6 classic Kirby™ titles along with several brand-new Challenge Stages like the ones in Kirby’s Return to Dream Land™ (Wii™), a 45-song music CD, a 48-page anniversary booklet filled with the details of Kirby’s creation and history and interactive timeline to learn everything about Kirby. This is certainly the special package Kirby fans of all ages have been waiting for. Immersive and Interactive Timeline to see footage and box art of all Kirby’s game releases. Some of the classic games include multiplayer modes. The main feature of Kirby's Dream Collection is that it is a compilation of six of the original Kirby titles. These are, in order of chronological release: Kirby's Dream Land, Kirby's Adventure, Kirby's Dream Land 2, Kirby Super Star, Kirby's Dream Land 3, Kirby 64: The Crystal Shards. All of these titles are based on the Wii Virtual Console releases and retain all emulator features of these releases; this also extends to the two handheld titles, which were never released on the Wii's Virtual Console service. In addition to the six games, the collection also features Challenge Stages, in which the player must clear stages based around a specific Copy Ability similar to the ones featured in Kirby's Return to Dream Land. Finally available is Kirby's History, in which the player can view an interactive timeline of all previous Kirby titles. This page was last edited on 14 March 2017, at 22:50.